Marty's act is a clever combination of spectacular juggling, fire eating and death defying feats, all wrapped up with non-stop humour. Most Australians have at some stage seen Marty perform, as he has appeared on every major television show in the country. He is perhaps best known for causing a furore on Ray Martin's Midday Show when he pretended to juggle live kittens with a running chainsaw, upsetting many short sighted home viewers... all in the name of comedy! Among his routines are the uproarious apple, bowling ball and egg juggle where he eats the apple during the stunt. There is the "dangerous objects juggle" atop a two metre unicycle where Marty enlists the help of the audience in getting started. 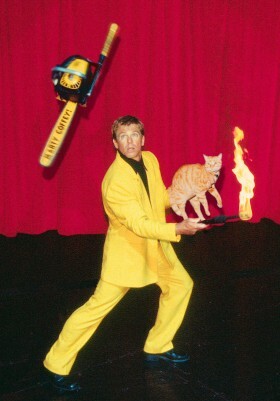 And of course he likes to finish on his now famous chainsaw juggle (sans kittens for the stage act!). Marty Coffey certainly has a sensational approach to comedy basing it around juggling - or a sensational approach to juggling basing it around comedy. Whichever way you look at if Marty Coffey has a sensational comedy act. Marty's credits include the highly successful 1987 national capital tour of the Broadway musical Sugar Babies. Critics said he "stole the show" when he performed his solo field directly before finale, and called him "Australia's funniest American juggler". With his high impact thirty minute show Marty has always been in huge demand as a guest artist for Australia's biggest touring acts. He has also supported international acts such as John Cougar Mellencamp, the Everly Brothers, Thelma Houston and Isaac Hayes. In more recent years Marty, now an Australian citizen, has become one of the most sought after comic performers in Australia's corporate market, performing at events for Mercedes Benz, AMP, National Mutual, Sony, IBM, Commonwealth Bank and Elders just to name a few. He has entertained at private functions for Kerry Packer, John Singleton and Prime Minister Paul Keating. His popularity is partly due to the large doses of sidesplitting audience involvement, a real winner at functions from small groups to gala balls. It is also the powerful universal appeal and versatility of his show, an important feature when perfection and professionalism are the standards.